Agilent Technologies introduces the ground-breaking InfiniiVision 4000 X-Series digital storage and mixed signal oscilloscopes. The new InfiniiVision series facilitates high levels of flexibility and ease of use among units that use embedded operating systems. As the only fully upgradeable family of five-in-one oscilloscopes in the category, the InfiniiVision 4000 X-Series also provides excellent investment protection. 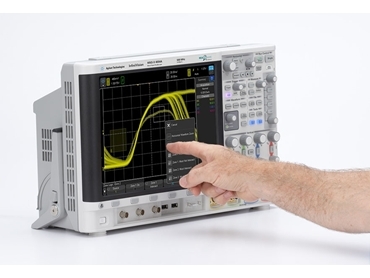 Offering bandwidths from 200 MHz to 1.5 GHz, the new InfiniiVision 4000 X-Series oscilloscopes deliver an industry-leading update rate of 1 million waveforms per second with standard segmented memory, which uses patented MegaZoom IV smart memory technology. Benchmark features also include a 12-inch capacitive touch screen, and the exclusive, all-new InfiniiScan Zone touch-triggering capability. Speed, ease of use and integration are the performance highlights of the 4000 X-Series. The high-speed waveform update rate ensures fast operation even with digital channels, protocol decoding, math functions or measurements activated.